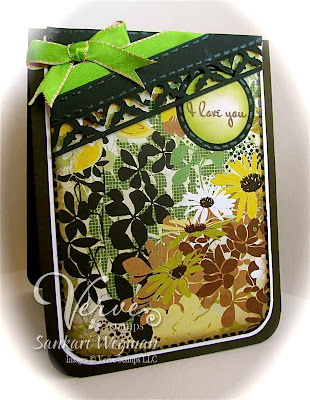 Spring Florals Blog Hop from Gina K! 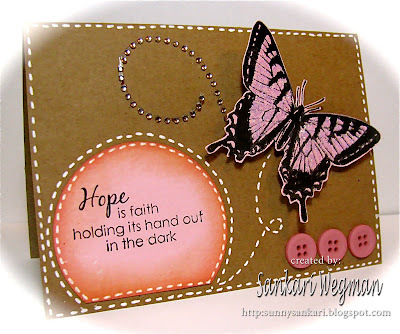 Stamps: Spring Florals by Gina K.
Paper: kraft and Luxury Pink from Gina K.
Stamps: Hope is Faith by Gina K.
There are many more projects that can be found in the Stamp TV gallery by Clicking on this tag: SpringFlorals. Enjoy all the samples tonight! If you haven't purchased this stamp set yet, please take note that the free Card Kit will be included with each purchase until March 18th. 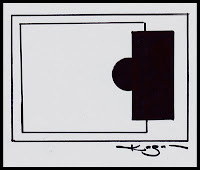 At that time, the next card kit stamp set will be released. I can't wait to surf on over! 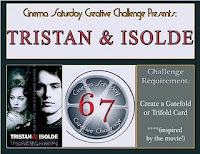 Every Saturday, over at the Cinema Saturday Creative Challenge blog, we pick a movie and then create a card inspired by the movie. 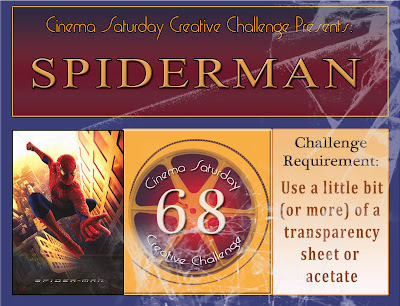 This week's pick for our 68th challenge is the Oscar nominated movie: Spider-Man that was released in 2002. 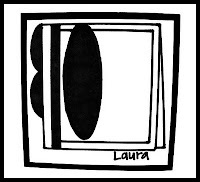 The Challenge requirement this week was to create something with some transparency or acetate in it. All of the rays coming out of the heart were a symbol of his desire to live up to the words of his uncle "with great powers, come great responsibilities" - the heart is his love for his Aunty May and his Uncle and out of that comes the web and for him to "Dare to be himself" I cut little bits of acetate and alternated them on my "kind of a web" part of the card (its so hard to take a picture of acetate!). 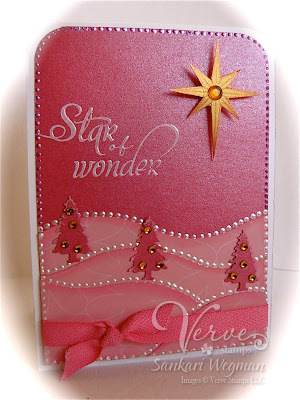 Christmas Stampin' All Year Long #42 - Pink Holiday Cards! Another post today, you say? 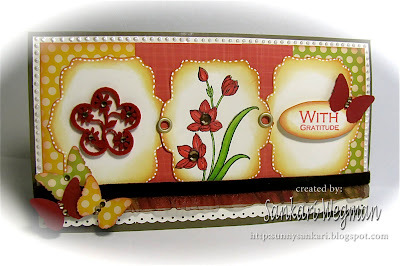 Well, every friday over at the Christmas Stampin All Year Long blog there will be a new challenge posted to help our mojo get going to keep creating holiday cards all year long. 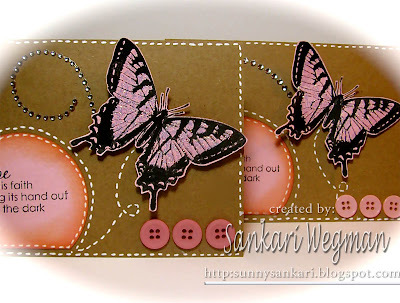 Today we have a challenge to create a holiday card that is mostly pink! I love this challenge! As much as I love the traditional colors for Christmas, its also fun to use the non-traditional colors to create a holiday card :) I used my scrap pieces of paper (hooray for using scraps!) 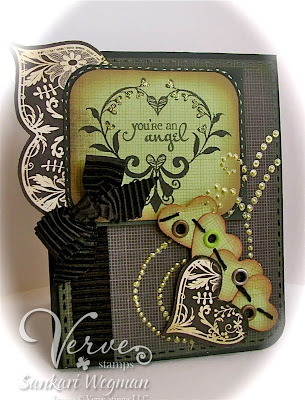 to create this card which is made using the Star of Wonder stamp set from Verve. 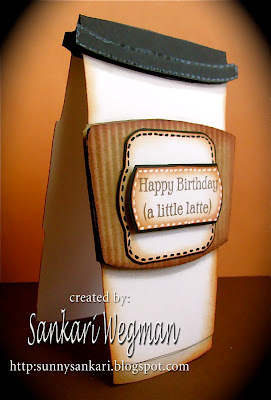 I loved creating this card and can't wait to make some more! I LOVE participating in this Christmas Stampin All Year Long group because its a way to keep the holiday mojo flowin' all year long :) Please hop on over to the CSAYL blog and check all the holiday pinks that the DT has created!!! Can't wait to see your lovely creations! 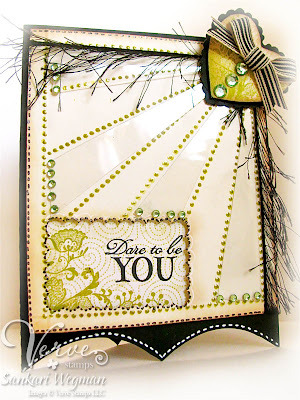 Embellish Color & Border's Challenge! Are you guys as ready for spring as I am? 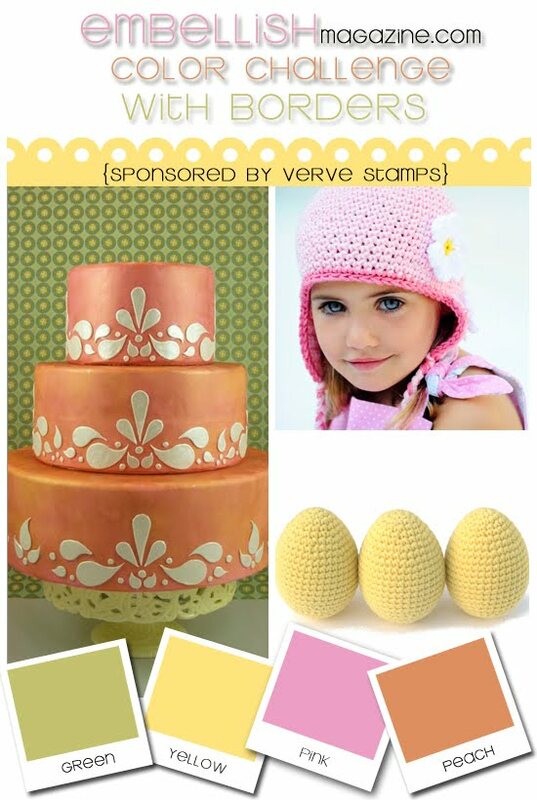 Well, today, there is a wonderful springy color, inspiration challenge that is happening over at Embellish Magazine that Julee, the owner and creator of Verve stamps is sponsoring. Here is the inspiration pic and I absolutely LOVE these colors!! Just looking at them is such a breath of fresh air - its like spring is just around the corner!! Woo-hoo! I don't know how much more winter we can take (or rather, "I" can take!) the kids seem to LOVE it everytime it snows, but to me, this late in the winter season it means more shoveling, more de-icing, and more crazy driving! Oh to be a kid again and sip hot chocolate after a hard days work of sledding!!! lol! Well, what a better way to "think spring" than to create something with these yummy colors! 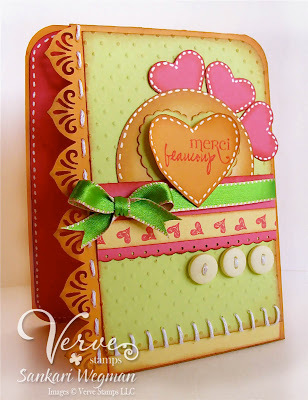 The challenge is also to do something with borders in your creation.I used Amber's beautiful sketch for Viva La Verve (Week 4) for this card using Julee's beautiful stamp set Thankful Hearts. 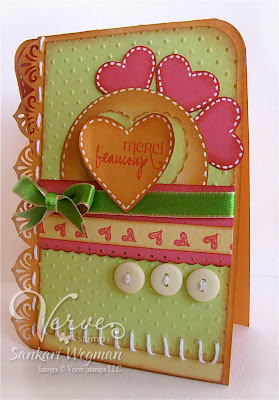 Accessories: MS/EK success punches, circle punch, rounder, CB swiss dots, Marvy scalloped heart punch, embroidery thread from Bazzil, Sakura white glaze pen and buttons/ribbon from stash. 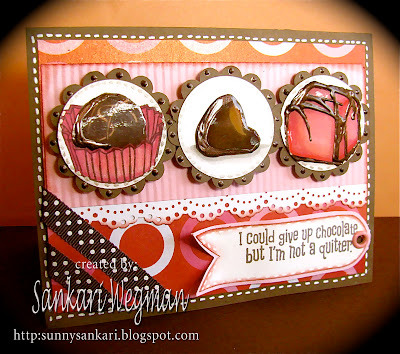 You can check out the challenge over here for all the yummy details and some yummy prizes as well! 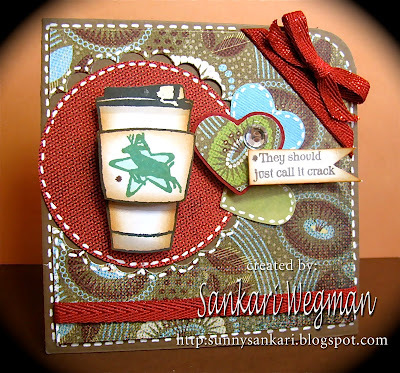 Today I am excited because I got a chance to play along with my girls over at 2 Sketches 4 You - YAY! I am still so sad that my time as a DT member is over but a huge highfive and congrats to amazingly talented 3some Alice, Heather and Kay who have joined the amazing DT and a big wave of love to Kazan and Laura who do such an. 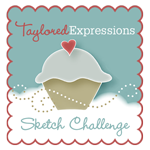 amazing job of organizing and creating this sketch challenge and for creation such a wonderful community over at 2S4Y. 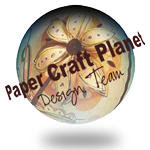 I am so glad that I could play along this week and am simply amazed by the wonderful samples from the DT :) Please check out the amazing samples and creations over at 2 Sketches 4 You and if you have a chance, play along! Sorry if I rambled there for a bit, its a little strange to talk... to the computer without feeling slightly dorkish :) so sorry for any dorkiness :)) but I am really so happy to be part of blogland and feel so lucky to have made so many wonderful friends in the process!! You guys rock!!! 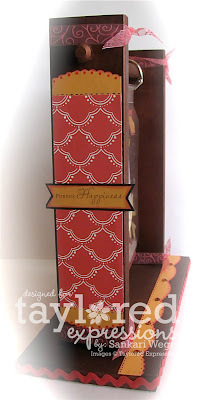 Here is a closer peek at the side of the calendar stand (it comes in natural color, and I painted it this color and then decorated it with some BoBunny papers. Feb. Key Ingredients from Taylored Expressions are here!! Its the 20th of the month and that means that Taylor is releasing a new Key Ingredients kit in her store! This month's Key Ingredients is SO FABULOUS! Seriously - this is a must have set! For those of you who are not familiar with Taylor's Key Ingredients - this is a great way to receive an amazing collection of designer paper, card stock, coordinating ribbon and accessories on a monthly basis all at a great value! All the work is already done for you - so no stress in finding that perfect ribbon to coordinate! Taylor provides a great way to store all of your monthly KI ingredients and there is a wonderful new blog just for the Key Ingredients that even has its own special monthly challenge!!! You can read more about the benefits of the Key Ingredients kit on the blog here! program - $7 from the sale of each set is donated to the Now I Lay Me Down To Sleep Foundation and as you might have seen yesterday on Taylor's blog, she is hosting a card drive to benefit the Neo-Natal Unit at the Sanford Medical Center in Sioux Falls SD. The dragon fly at this medical center is a special symbol of hope and cards with dragonflies are given to families who have lost their newborns either in delivery or in the early stages of life. You can be part of this card drive by donating cards with dragonflies on it. 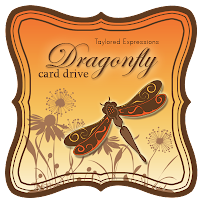 Taylor is creating such a wonderful dragonfly card drive and just by sending a card to the hospital - you could be entered to win a gift certificate from the Taylored Expressions Store! Please check out all the details on Taylor's blogpost from Friday that you can see here. You can see some of the different black and white designer papers that are part of this set - and even after making all these cards - I have a TON of supplies left over!! Can't wait to use up every single delicious drop of this set! I just absolutely enjoyed every single minute of creating all of these projects with this wonderful Key Ingredients set!!! And guess what else? Taylor has something new that she is sharing with us today! Monogram Downloads!!! These are awesome - they are so easy to use - and come in a TON of different options with sizes with the punches we have - so its already to go! 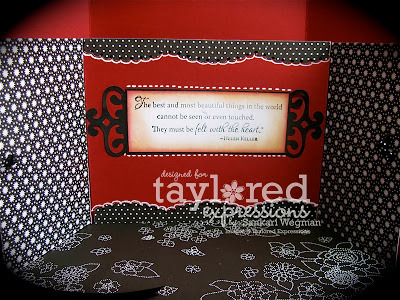 Check out all the details on Taylor's blog and you might see some Marvelous Monograms as you surf the rest of the Baker's Dozen who are showing off some amazing creations with this set - I can't wait to surf over and see them!!! Thanks so much for stopping in today!!! Have a wonderful weekend!! Can you believe its already Friday? Can you believe its almost March! Can you believe its 2010! lol! 2 layers, 3 buttons and glitter! If you want to get your christmas cards going -join in on the fun and check out the Christmas Stampin' All Year Long blog to see what all the lovely ladies have created with this awesome recipe challenge! Thanks so much for stopping in and TGIF!!! 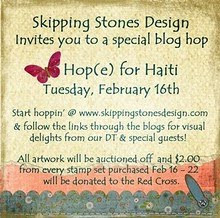 I am so beyond honored to be part of this amazing blog hop called Hop(e) for Haiti that is being organized by Skipping Stones Design. 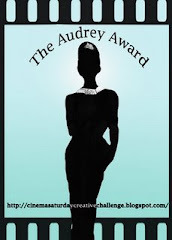 If you happened across my blog today (thank you!) 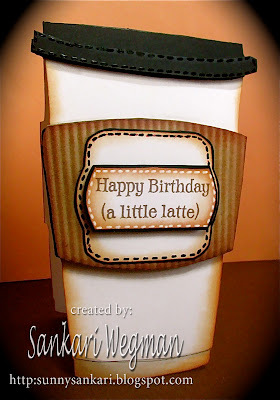 you'll want to start at the beginning of the blog hop at Skipping Stone's Design! This lovely company wanted to do something to give back to the people who have been devastated by the Haitain Earthquake. They have invited us to join them in this cause. Each card you see on the blog hop will be auctioned off on e-bay, with all the proceeds going to the Red Cross in support of the Haitian Relief Effort (please check out the link at the Skipping Stones Design website for the link to the auction). 100% of the proceeds of the e-bay Auction and $2.00 from every stamp set purchased from February 16-22 will be donated to the Red Cross. 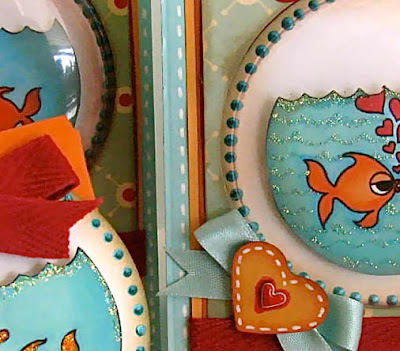 Accessories: spellbinders, circle punch, corner rounder, glimmer ribbon, glaze pen, dimensionals and bling. Here is an individual picture of each one. 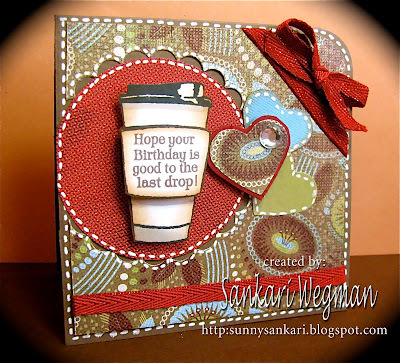 Here is the card: "Hope your birthday is good to the last drop"
Sankari Wegman <----- you are here!!!!! How about a prize? In addition to the fabulous eye candy, we have decided to hide a prize somewhere along the hop! 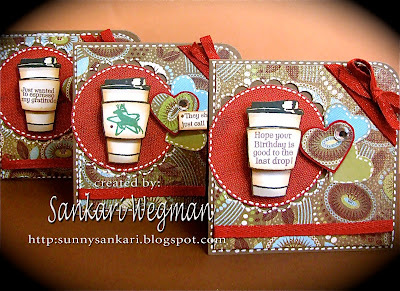 There will be a few pre-release sets up for grabs hidden along the blog hop. The fun part is...we're not telling you who it is! So as you hop, make sure you leave comments on every post so you have a chance to win!! Thanks so much for stopping by my blog today!! 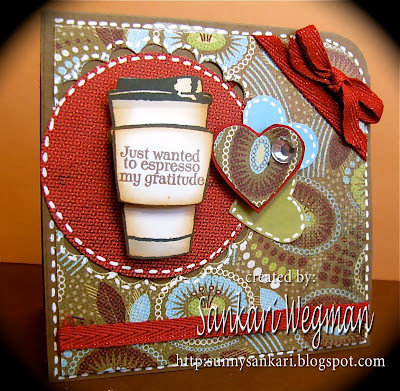 Hop on over to Laurie Schmidllin to see her amazing creativity!!! If there is a break somewhere along the way, there will be a masterlist of all the blogs participating in the hop over at Skipping Stones Design or at Sparkle and Bling!!! This is such a wonderful Hop(e) for Haiti - and I feel so honored to be part of this!